Two years ago this month I started a meetup group on Meetup.com for watercolor painters in Seattle. Since then it's blossomed into a cohesive community with 94 members and a history of 167 meetups. We get together once per week to paint indoors and once per week to paint outdoors, in addition to various individual meetups to attend art shows and exhibits. Close friendships have formed within a supportive atmosphere, and everyone has learned a lot of new things about art. 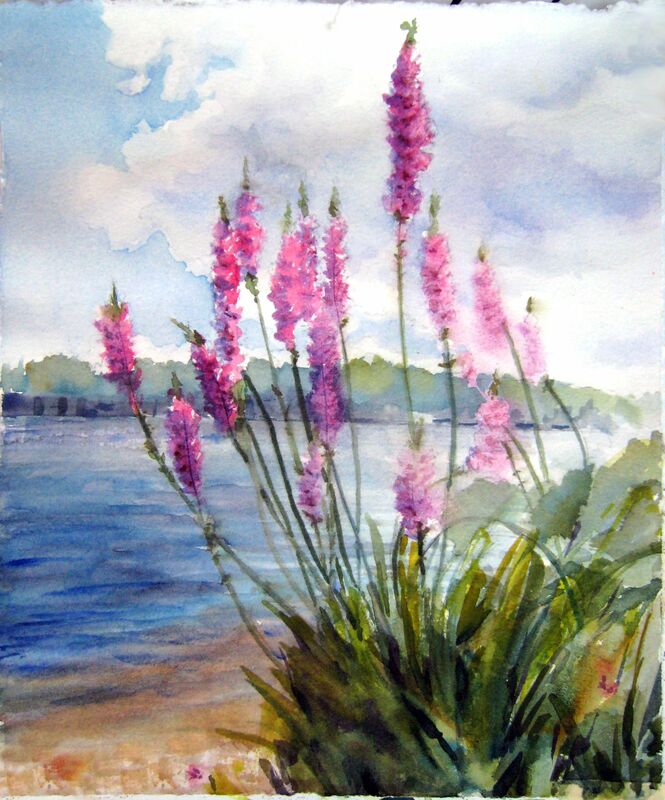 The other day Barbara emailed me, asking for suggestions on how to set up her own watercolor meetup group in Everett. After responding with a lengthy missive, I decided to post my reply here as well. Usually when someone asks me a question, others are also interested in the answer. You can associate keywords with your site that allow meetup.com members to find it. For example, my site has keywords such as painting, watercolor, art, and plein air. Individuals who have already joined meetup.com and listed one of your keywords as an interest will be notified about your site. In addition, anyone searching the internet for such a group will be able to find it, even if they haven’t already joined meetup. To see how my site’s set up, go to http://www.meetup.com/Seattle-Watercolor-Meetup-Group/. 2. Decide whether to charge members for a meetup. You have the option to charge members for attending your meetups. I decided not to do this, even to recoup the cost of the site, because I didn't want to get in cross-ways with the community center where we meet each Friday. They give us space in return for a $2-3 drop-in fee per person because we’re considered non-profit, as I don't charge anything for the meetup. You'll figure out how to handle that issue in a way that works best for you. Here's a photo of the Friday meetup, held in a wonderful space at the Loyal Heights Community Center in Seattle. This photo was taken a year ago. Now, we need two rows of tables to accommodate all of the attendees. 3. Choose a focus for the group. I decided to have our meetup group focus on watercolor painting for two reasons: (1) I'm a watercolor painter, and (2) watercolor is non-toxic and appropriate for doing indoors in a public space, such as the community center. During the cold, rainy Seattle winter, it’s pretty difficult to paint outdoors, and I wanted this group to meet at least once per week all year round. For our outdoor meetups, members are free to paint in any medium, although, interestingly, even the oil painters in the group opt for watercolor. 4. Set goals and the overall tone of the group. From the beginning, I wanted this to be a highly participatory group, rather than have everything rely on me. I scheduled the first meetup at a coffee shop, to discuss what members wanted to get out of the group. In that meetup we decided on a day and time to meet each week, based on the availability of a suitable room at the community center. We also discussed our collective "vision" for the group, determining that it was to develop a supportive and collaborative community of artists. 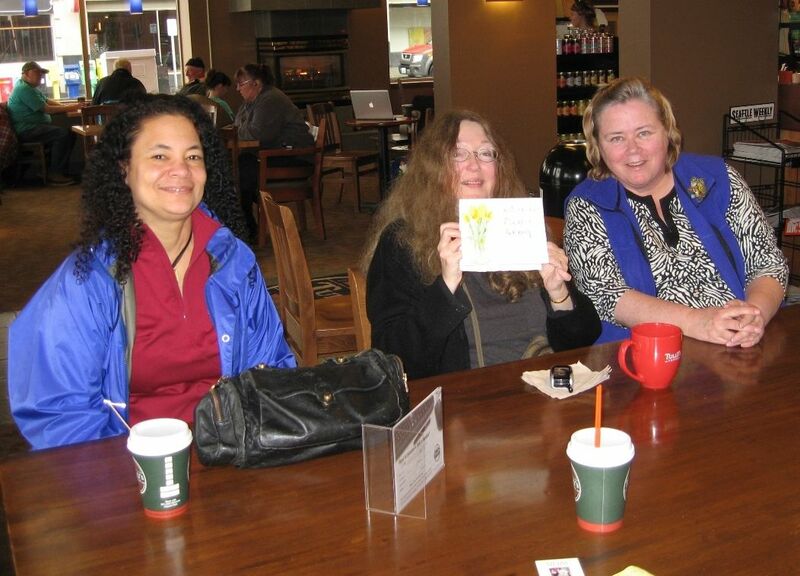 Our first meetup was held at Tully's Coffee, to discuss what we wanted the group to be like. From that first meetup I emphasized that members should expect to get out of the group no more than what they put into it, and that each person is responsible for their own rewarding experience. I believe this set a positive and constructive tone that has been fundamental to the success of our group. 5. Increase membership. There were four artists at the first meetup. Of the original group, only one has dropped out, and over two years we've steadily added members. Today we have about 94, with 12-16 in attendance on any Friday. Our "paint around Seattle" group gets 4-8 weekly depending on the weather. This second weekly meetup spontaneously started after the first one had been running for a full year. 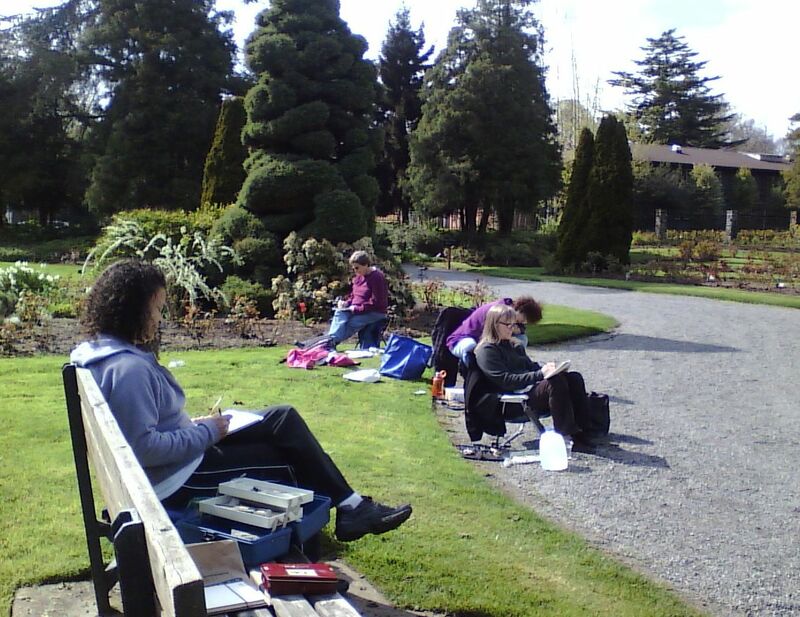 Our first "Paint Around Seattle" meetup, held last April in the Woodland Park Rose Garden. We get a different mix of people each week, but active members come at least once or twice per month, so there's a lot of continuity, and some deep friendships have formed. Being an artist is a lonely occupation, and our group has brought many professional artists in addition to absolute beginners and everything in between. I believe the key to this success is the participatory nature of our group and emphasis on being supportive and positive. Attendees frequently comment about how warm, welcoming, and fun this group is. 6. Encourage participation. I encourage members to propose and host additional meetups and have named four co-organizers. If someone is interested, I coach them on how to set up a meetup (basically, you need a place to meet and need to greet people and make them feel welcome). Additional meetups can be scheduled in a series or be held just once for something like attending an artwalk, show, or exhibit. 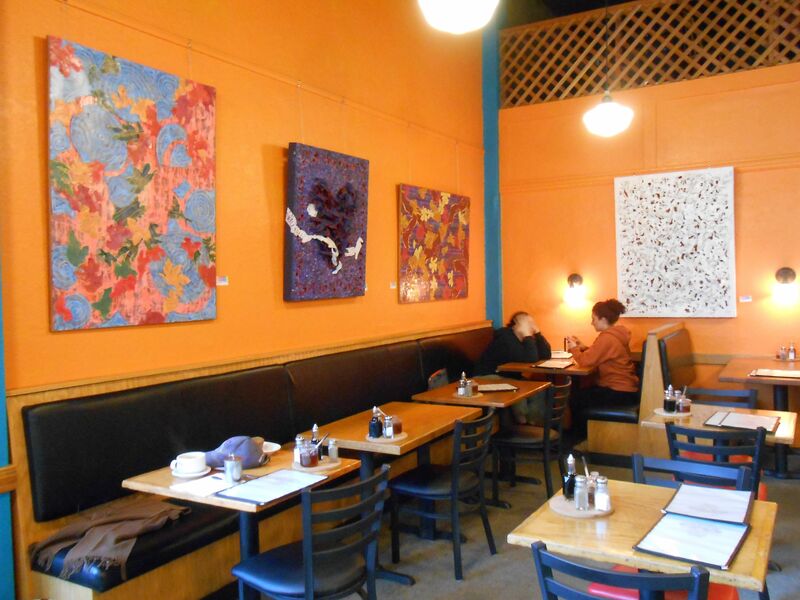 The work of member artists are included in shows all around Seattle, which we often attend in informal groups. I wasn't able to attend the opening of Nelda Hanson's show here at the Sunlight Cafe, but I met up with Beth later to view it. One member, Eileen, has taken over the Thursday "paint around Seattle" group and figures out the place to paint each week, updates the meetup site, and exchanges cell phone numbers with people who plan to attend, in case anyone gets lost. Another member is hosting a non-publicized meetup at her studio twice per month in the evening for members who work. It isn't publicized for reasons of safety. She invites specific members offline. I want to make this group as self-sustaining as possible, to succeed with or without me, but have come to realize that completely replacing myself as group leader requires at least one willing party and a lot of coaching -- and willing parties are rare. My current strategy is to hand off as much responsibility as willing members will take on, hoping that if and when I can no longer lead the group, there will be a few folks around with enough experience to keep the thing going. 7. Tips for conducting your meetups. Regarding conducting meetup sessions, it's vital to have a person "on point" for each one. For our group, this person (the host, me, or someone I nominate) makes sure that the still life and tables are set up for indoor meetups, greets each person as they arrive, and introduces newcomers to the others. This person sets the tone for the meetup, which is friendly, non-critical, and supportive. Ideally, this person will also have some ideas in mind to discuss about watercolor painting. This is especially important when the group is getting off the ground to help break the ice, but it's great any time. I used to provide a 30-minute seminar at the beginning of each meetup on watercolor basics. Sometimes I'd demonstrate a particular technique or else bring in a book to discuss. I encourage other members to volunteer for this, and when they do, it's a great addition. 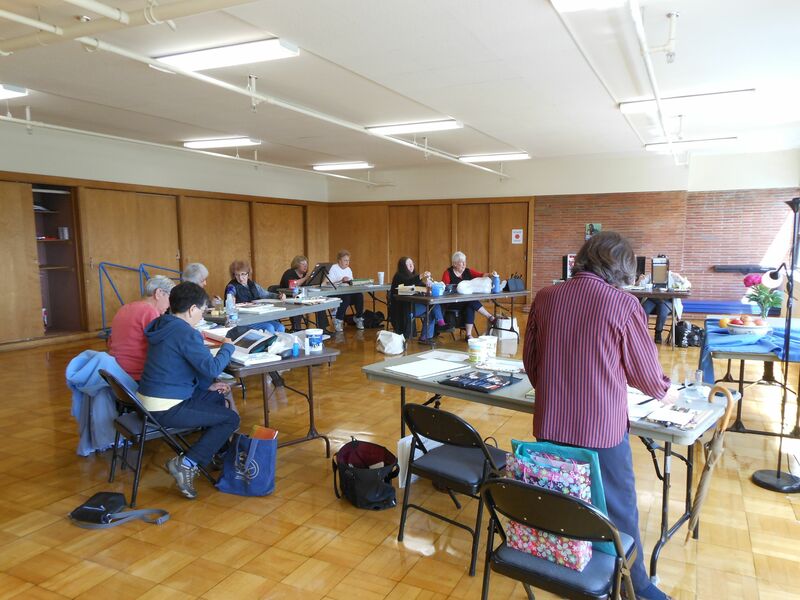 The purpose of the group is to exchange ideas and develop a supportive art community, and getting to know one-another personally is key to these goals. It's helpful to have some off-topic topics in mind for this purpose. While people are sitting around painting, if the silence becomes deafening, it can be nice to discuss a good movie you've just seen, an exhibit, a book, and so forth. Most often, though, our conversation naturally settles on some aspect of art. Initially I brought tea and cookies, but that was too much overhead, so abandoned that idea after a while. It's nice to do, but anything can get tedious if it becomes an obligation week in and week out. 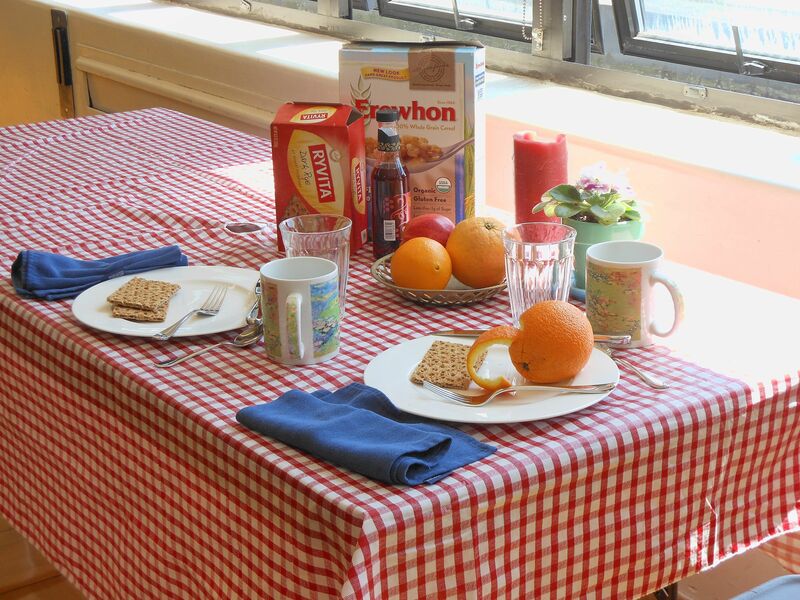 I have, however, set up a still life each Friday for almost the entire two years we've been meeting indoors. This, believe me, gets old, but at the same time, it's important to do. For one thing, painting from life is different than painting from photos. In addition, it helps generate discussion as people walk around and look at each others artistic "take" on the same subject. After a lot of prodding some members have started bringing in still life ingredients so I don't have to do it all, and occasionally a member will handle the whole thing, such as in the rare event that I'm not there (like at the moment, when I'm in Australia visiting my daughter). "Nell's Breakfast" still life setup. It’s a good idea to bring a camera and take snapshots of people painting as well as their work (if they're OK with that) to upload to the site. I also encourage people to upload their own photos of what they painted. People are shy about doing this, but less so when I tell them it's for the benefit of the rest of the group, which is true because the photos generate comradeship and chat. We all encourage and inspire one other in the Seattle Watercolor Meetup Group. The tone of our group is absolutely positive at all times. We've never had any disagreeableness, except one time when a new member came solely for the purpose of selling her art and dominated the session with her non-stop self-promotion. Members were polite, although quite irritated. Thinking it over afterwards, I decided that should something like that happen again, I would step in let the person know they were out of bounds. The woman didn't get the response she wanted and never came back, fortunately. Members have told me over and over again how important this group has become in their life, which makes the effort that I put in feel worthwhile. I hope you’ll decide to create a similar group in your own area. If you do please let me know. Also, feel free to ping me with any questions. Christina Scott painted this during a meetup at Greenlake. Art Studio On Wheels - How I set up my art studio in a small space. Setting up an Outdoor Easel - I demonstrate how I converted my camera tripod into a watercolor easel. How to Frame a Watercolor Painting - It can be a bit tricky your first time. Here's how I do it.